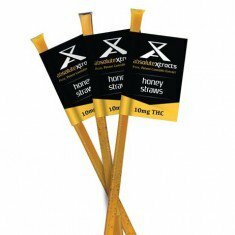 THC Honey Straws are edibles suited for both medical and recreational use so you can opt for low doses if you’re not a seasoned marijuana user. This delectable treat packed with the high potency of THC is for everyone. It has a typical hybrid flavor and is quite versatile in use. Add it to your yogurt, tea, fruit beverage, or eat from the straw. If you have superb culinary skills, get creative with these Honey Straws and enjoy them—whichever way you like!